Goofy and pluto 2 cute brothers since aug 11!!! 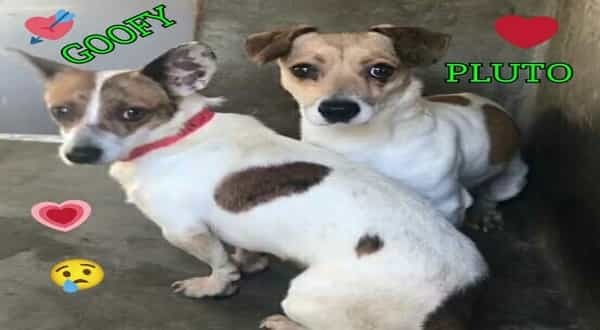 urgent at south la shelter los angeles: jack russel/chi mix? both males, 2 years old, 16 and 12 pounds, dumped by their owner healthy and so cute! but very scared, shaking and sad for being totally overlooked since aug 11.
watch videos please share for pledges, foster, adopter and rescue asap! shelter is full! My name is Goofy and I am an unaltered male, white and brown Chihuahua - Smooth Coated mix. I weigh approximately 16 pounds. I have been at the shelter since Aug 11, 2017. My name is Pluto and I am an unaltered male, white and brown Chihuahua - Smooth Coated mix. 1 Response to "Dumped by their owner, very scared, shaking and sad for being totally overlooked at kill shelter"